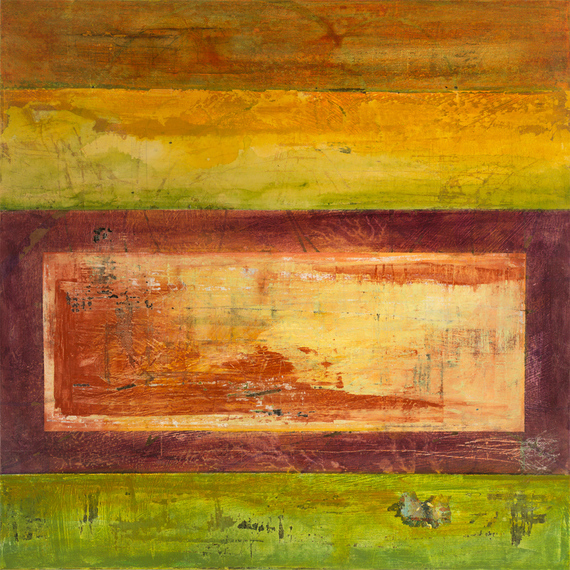 Artist Lorraine Lawson is interested in topophilia: a strong sense of place as connected to culture. Deeply aware of human interconnections across time and place, Lawson is an artist whose work is rich in sensual emanations and symbolic interchanges. I recently interviewed Lorraine to learn more about her art and her background. Lorraine Lawson Tell me a bit about your early life and education. My father was stationed in Liege, Belgium serving in the US Army at the end of WWII when he met my mother. Travel was a big part of my childhood. I made visits back to Europe including trips to Germany, Holland, Luxemburg, England and France that were full of cultural exposure. The stateside tours of military duty and the many road trips pulling a very small trailer to visit family cross-country exposed my two sisters and me to a variety of lifestyles. We settled in the San Francisco Bay Area which I still call home. After high school, I attended West Valley College to start my art education. A tumultuous relationship and a few other family factors got me thinking about making changes in my life path. I joined the US Navy. The adventurous side of me weighed heavily on the decision to leave to "see the world" instead of staying in an uncertain family and financial climate. As it turned out, I was stationed in Southern and Northern California. So much for seeing the world! I suppose it was geography that pulled me back to my high school sweetheart and we married at 19. Always desiring to earn at least a BA degree, I kept talking classes to eventually achieve that goal. Juggling my family life with two daughters and my job as a dental technician in the Navy, it was a slow process, but I found education comes in many forms. 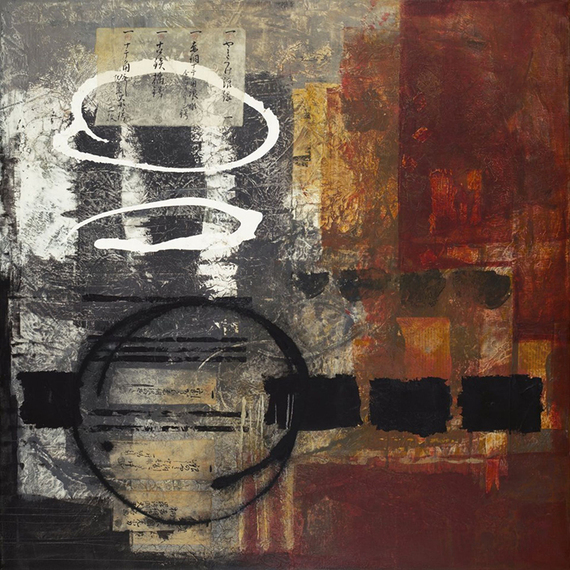 Tanren, Mixed Media, 36 x 36 inches How did the presence of paintings in your home by your great-grandfather (Gustave Flasschoen) influence your development? The cultural influences from Belgium and beyond were abundant in our home. My great grandfather was a prolific painter. In addition to his neighboring countries, he traveled to Morocco, the Belgian Congo, Algeria, and other African countries to capture the essence of their culture. Landscapes, figures, still life...all were part of his portfolio of oil paintings, drawings, and sculpture. Not only was I drawn to his technical ability, but his subject matter imparted a sense of adventure in me. His Bohemian spirit fascinated me. Changes, Mixed Media, 24 x 30 inches How has your art evolved over time? From an early age, I knew I saw things differently. Inspiration came in many forms. All of my senses were tuned into expressing myself in an artistic way. Sights, sounds, smells, textures excited me and inspired my artistic life. While I began in a very traditional way by painting landscapes and still lifes, I was always drawn to textures and forms. I could easily "abstract" what I saw by simplifying their shapes. After trying to conform to the expectations (so I thought) of my audience, I sought my real voice. My desire to capture the essence of a thing is far more fulfilling and has allowed be to develop my own visual language that conveys culture, lifestyle and the beauty in things that time has affected in interesting ways. How do the themes time and memory influence make themselves present in your art? I can't say enough about how travel has impacted my work. From the various cultural topography to the sounds, smell, tastes and textures of different places around the world, Travel has provided a bounty of inspiration for my work. Walking opens my eyes to the minutia and detail of the impact people have on our urban and rural terrain, the good, the bad, and the ugly. 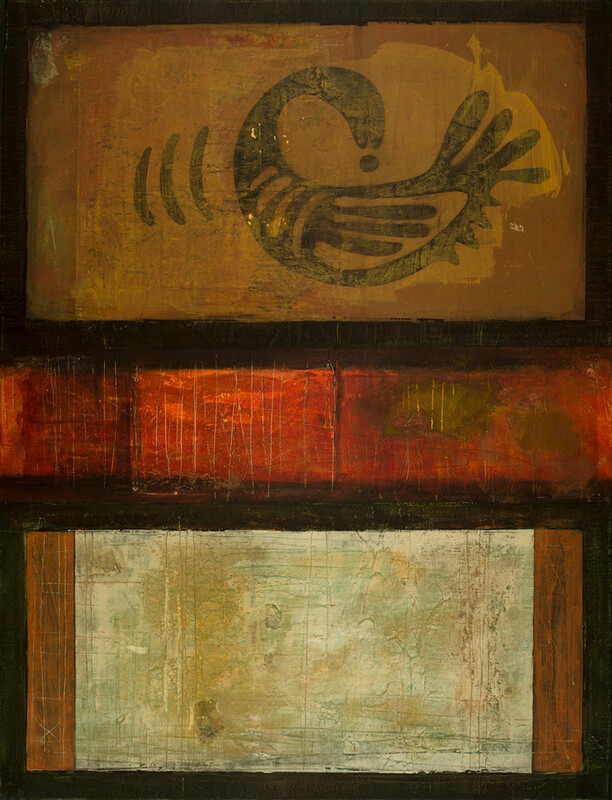 Sankofa, Mixed Media, 48 x 36 inches Can you break down some of the symbols and ideas in one of your recent works? One of my more recent pieces was inspired by my experience with mentoring foster youth. I learn a lot from them as they work through their art making. Learning of their backgrounds, many life experiences, most often very challenging have had an impact on me. "Sankofa" is a symbol from the Adinkra tribe in Ghana. The essence of its meaning is that one must return to the past in order to move forward. We must go back and reclaim our past so we understand why and how we came to be who we are today. I witness many of the kids work through this concept as they create. It's quite a powerful experience. Another symbol that I love to use in many of my paintings is the Enso Circle. In Zen Buddhism, the Enso is meant to express a moment when the mind is free to let the body create. It symbolizes absolute enlightenment, strength, elegance,the universe, and the void. While I don't profess to be a Zen master, the very presence of the enso circle reminds me to be present. 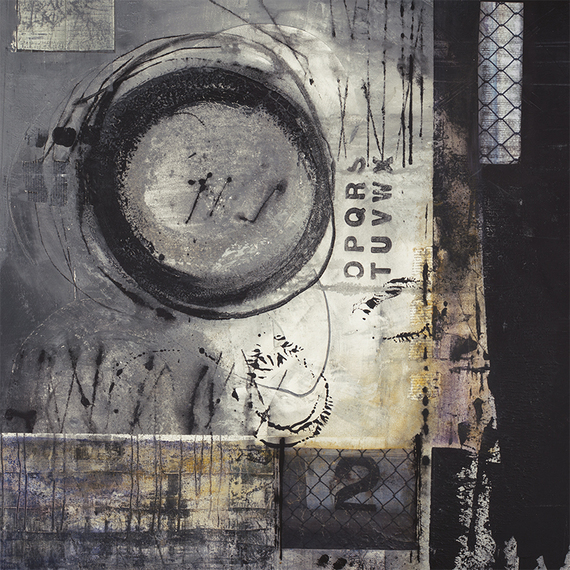 Cannery Row, Mixed Media, 36 x 36 inches Where have you traveled and how has travel affected your imagery? Always loving the travel I experienced with my parents, I continued to travel with my husband and daughters. My first marriage ended after 20 years, but it hasn't changed my ability to seek my passions. I've since met and married a wonderful man who shares the same adventurous spirit. Before we met, Dan traveled the world on a 40 foot sailboat that he and his father built. It was a match made in heaven as I knew he was creative and had the same thirst for interesting life experiences. Our travels to Europe have impacted me in similar ways that my mother's stories of her own life in occupied Belgium in the 1940s. The history of each country is fascinating. The languages, the foods, the behavior, the dress, but most impactful are stories that old buildings and other surface can tell. Most recently, our visit to Pompei had a profound affect on my art. We spent hours discovering so much about their culture and tenacity: it was a very moving experience. A trip to Bali inspired a body of work that represents the beautiful, spiritual people. The essence of the Barong dancers and other cultural influences that we enjoyed are embedded in my mind. The Eastern aesthetic shows up in my work in the form of abstracted fragments of calligraphy. I take a weekly calligraphy class that I find very challenging. I tend to look at the beautiful shapes of the work we're doing, wanting to use the essence of the work, not the literal meanings. I have a collection of practice sheets on delicious paper that I use in my work. Occasionally, I'll blow them up five times their size (or more) and use them as starting points in my compositions. 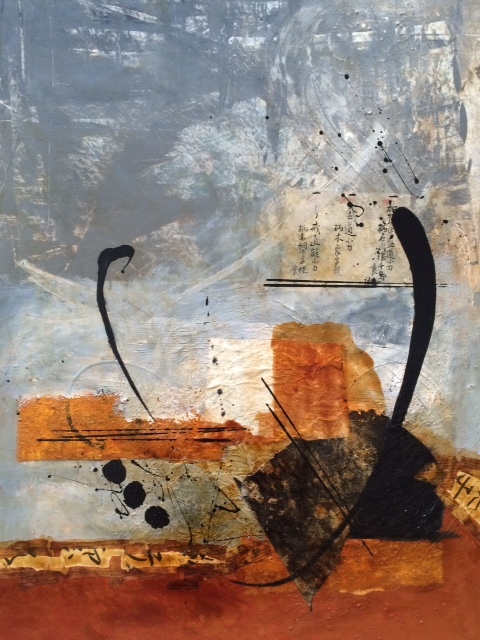 Wabi Sabi, Mixed Media, 40 x 30 inches Tell me a bit about your working methods. Messy! Ephemera everywhere! I collect books, letters, maps, sheet music, poetry, dirty scraps on a busy street corner. I love it all! Texture mediums, trowels, squeegees, any mark-making implements I can get my hands on end up in my studio. Estate sales provide endless fugitive memorabilia from which to give new life in my paintings. I'm so inspired by the stories that they conjure up. A big part of my practice is the enjoyment I get from spending time with my fellow artists. Sharing ideas, frustrations, opportunities, and just showing up for each other. As artists, we spend a lot of time isolated from the outside world in our studios and in the business of art. It's important to have that support system to remind us that we're on the right path. That support also comes from my husband who gets me and my absolute need to live the creative life. I'm so grateful! I have a thirst for new ways of creating. Studying art history and the many artists I am inspired by are my favorite reads. It's my current form of continued education. 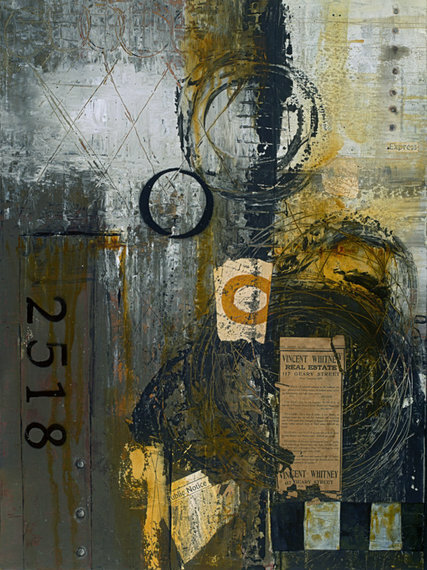 If Walls Could Talk, Mixed Media, 36 x 24 inches What are your interests outside of art? The time I spend with my husband, Dan is most often creative, inspiring, adventurous and nurturing. Travel! I am a very present grandmother of six, mostly on my terms, which means doing creative things with them. Time with them in my studio, taking them to plays, ballets, their own activities which include sports are a big part of my life. I know when to say I'm unavailable and it's usually for my art career. In fact, I passed up an opportunity to do an art residency in Morocco this past year due to a difficult pregnancy my daughter experienced. I just didn't feel right about being gone. I was so intrigued by this particular residency because Gustave spent time painting there in the early 1900s. I wanted to be where he was to capture that Bohemian spirit and have it inform a new body of work. To be accepted to this residency and to be invited at a later date by Green Olive Arts in Tetouan has made me feel so fortunate!